The longer I use this, the more I like it. I have a trial size of this for free. It is super clumpy was my first impression leading me to hate it at first. I decided to give it another go and find that it really does give my lashes volume and holds a curl well. It also thickens well but I hated how it smudged like crazy. I was left with raccoon eyes two hours after applying this and it is a pain...read more to get off--even with my makeup remover! I ended up losing a few of my lashes during the process of washing this off. Besides it flakes off too. I was given a sample of this product to try by Total Beauty. I had been wanting to try try this mascara for the longest time! I was not dissappointed. The blogging community loves it, and though I do not love it as much as I would have liked to, I think it is a good enough mascara. I do not care much for volume, but I am more looking for lenght, because my lashes are so short though I have plenty...read more of lashes. The container is beautiful and the brush does a good job at applying the mascara evenly, great black color. In the volume department, this passes with flying colors, it falls short of expectations in the length department. It holds the curl really well. Would I buy again? Probably not, because you can get the same results from a regular drugstore mascara, for a much lower price. 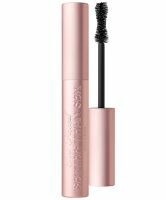 I would buy this mascara if I was a big TooFaced cosmetics fan. I cannot use mascara at all so I had my daughter try the mascara and review it for me. She is amazed by the results and says the mascara actually curled her lashes perfectly. She also says the mascara makes her lashes appear longer and desires to own the rest of the product. It did not clump lashes together and it actually separated them. And because of the curling effect, she did not have to use her eyelash curler which was thrilling.